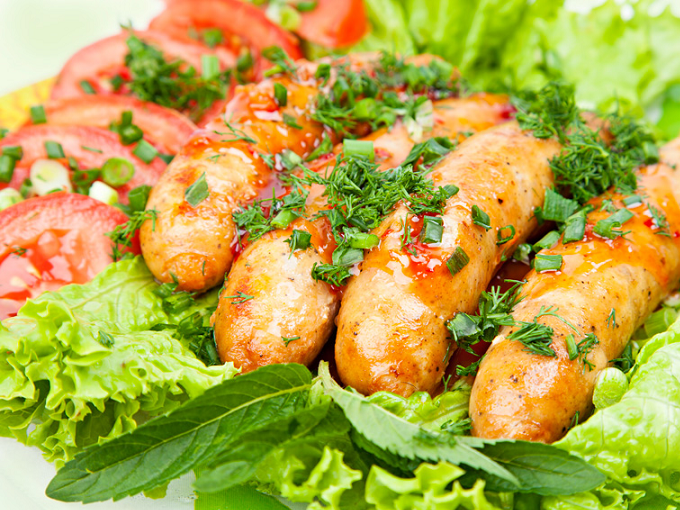 There is nothing easier sausages, hearty mix, which is prepared in minutes. However, this product can be the basis for the creation of a full hot meal with a claim to originality. Fry sausages in a tasty thick tomato sauce, with eggs or crispy corn dough. - 2-3 leaves of lettuce. Sauté sausage in vegetable oil for 3 minutes over medium heat, turning occasionally. Bring them forth, and yet set aside. Remove the skin from one tomato, grate the pulp on a grater and put it in the same pan where you prepared the main ingredient of a dish. Let the tomato mass to become homogeneous, add the flour mix and lightly fry. The skin of the tomatoes comes off easier if pre-scald vegetables with boiling water or scratched his blunt side of a knife blade. Dilute the sauce with hot water, stir, to avoid lumps, pepper and salt. Put it in sausage, heat them a little and remove the dishes from heat. Cover a plate with lettuce, put them contents of the pan, pour the sauce, sprinkle with parsley and garnish with slices of the second tomato. Deeply cut sausages crosswise in increments of 0.5 cm. Gently roll them in the whole circle inside, and tie the ends with toothpicks. Heat vegetable oil and fry in it the ring from one side, then flip. Break in each egg. They add salt a pinch and fry for another minute. Transfer the sausages on the plate with a wide blade and sprinkle mini eggs dried Basil. The dish will be more attractive if you first pour in the protein, and as soon as he almost grabbed, put on top of the yolk. Mix both kinds of flour with baking powder, starch, salt, sugar and black pepper. Whisk separately the egg with the milk and stir into it the bulk mixture. Pour the liquid flour ground in a narrow glass. Neat string of sausages on wooden sticks, leaving 3-4 cm of the ends. Place on high heat in a deep pan and heat it with vegetable oil. Make sure that the sausage was not wet, otherwise the dough will hold. If necessary, dry them with a paper towel. Lower the sausages into the batter, holding them by the skewers, and immediately put into hot fat. Fry them until it will turn brown and crunchy turning in a circle every 20-30 seconds. Use long tongs to not burn my hands. DAB ready "skewers" with a napkin to remove excess oil. Serve them with your favorite sauce.